Nanuya Island Resort Fiji is a great value mid-market resort in the Yasawa Islands and offers comfortable serviced wooden bungalows, a beautifully designed fully licensed restaurant and lots of watersports on a sandy point facing the protected lagoon between Nanuya Lailai and Tavewa islands. The beach is gorgeous and there's excellent snorkelling making Nanuya Island one of the best holiday spots in Fiji. 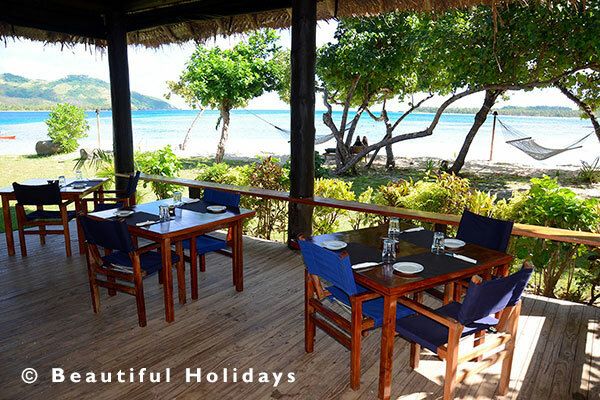 With a total of only twelve bungalows, this is an intimate setting ideally suited to couples. Four traditional style hillside bungalows and two treehouse bures offer smaller living space than the Beach Villas with a double bed and en-suite bathroom with hot / cold water. These are set on the hillside up steep steps and are not advisable for older couples (can be slippery when wet). The views through the trees though are fabulous. The four deluxe beach villas offer 180 sq ft of living space with a double bed room and two single beds in the lounge, a mini fridge, tea and coffee making facilities, ceiling fan and a large wooden veranda surrounded by landscaped gardens. These are set on the flat overlooking the beach amongst coconut trees and tropical vegetation. West Side Water Sports, a PADI International Resort Association member, has a fully outfitted onsite dive centre with a full range of Scuba Pro gear and running full courses. The two custom made Naiad dive boats, a 9 meter open boat and a 11.3 meter covered boat, give quick and comfortable access to 20 dive sites in a 10 mile radius of Nanuya LaiLai Island. Diving conditions are dependent upon two major factors: the amount of wind and the temperature of the water, the greater the amount of wind and the warmer the water the poorer the visibility. Fortunately the trade winds run from May to October and the warmest water temperatures are experienced from December to March; therefore each is a trade off and there are fairly consistent conditions year round. On average visibility ranges from 15 meters to 30 plus meters and is dependent on conditions of the day. The coolest water temperatures are from July through to the end of October and are about 25 degrees Celsius. The warmest water temperatures, from December to the end of March are about 29 or 30 degrees Celsius. Most divers find that a 3mm steamer is sufficient in the winter months and a 3mm shortie is plenty for the summer months.